Cost estimate and elemental cost plan item rates can be built up by linked priced bill items, or entered as a plug-in rate. Elemental rate benchmarking provides graphic comparisons of elemental rates for your current project, to relevant building type benchmarks. 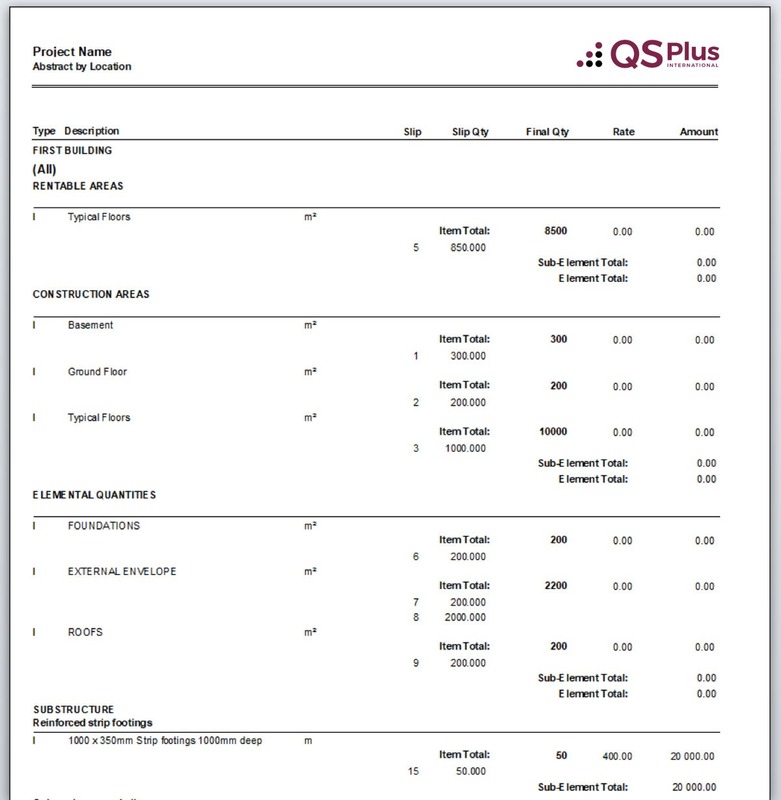 Fast and easy conversion of cost estimates and elemental cost plans to bills of quantities. Measure, price and output cost estimates and elemental cost plans with all levels of detail. Regional libraries of cost plan rates may be maintained. 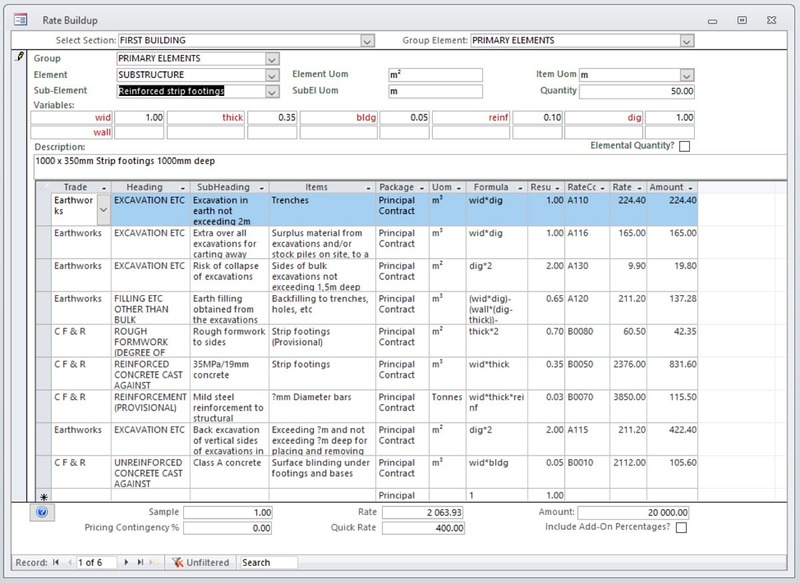 The ASAQS guide to elemental cost estimating is included as a help file on the system. 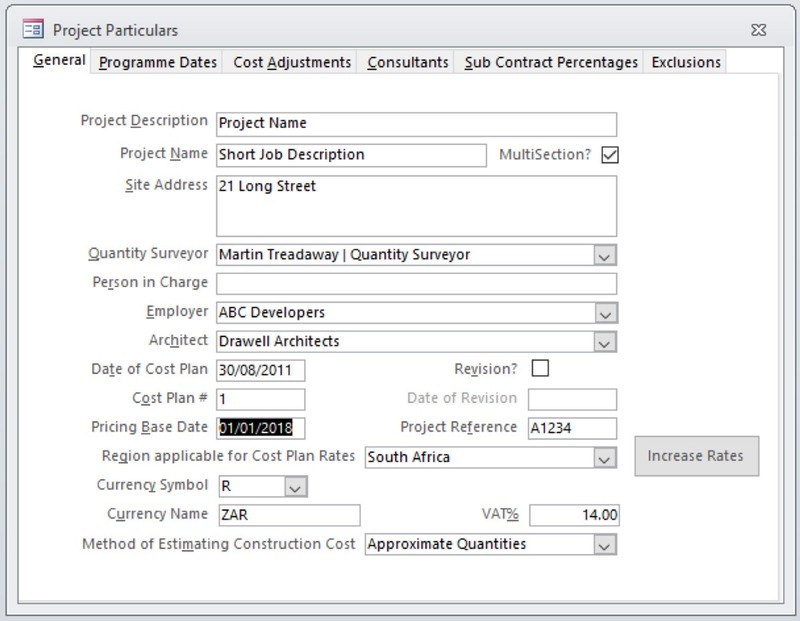 General project data parameters are includedz, such as “Project description”, “Client”, “Consultants” (selected from central database), “Cost plan dates”, “Program dates” and “VAT”. Enter percentage and price increase forecast data, for auto calculation of escalations from cost plan date to project completion. Set percentages or amounts for auto calculation of professional fees. Set percentages or amounts for auto calculation of preliminaries and contingencies (prelims can be measured if preferred). Enter descriptions for additional provisions outside of the cost plan. 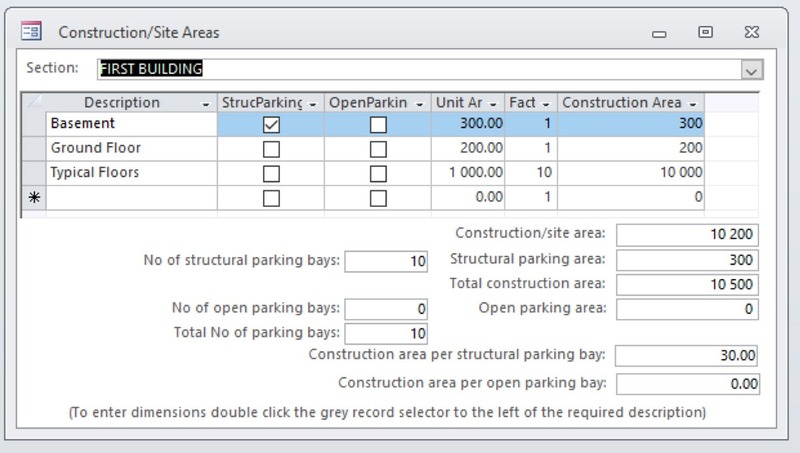 Set up elemental cost plan sections for multi-use building cost plans and locations within each building, for when more detail is required. Locations carry a factor which can be amended. Consultant’s drawings can be registered in “Contract particulars”. Professional fees can be set up differently for each section. Preliminaries and contingency percentages or amounts can be set up differently for each section for auto calculation. Program dates defaulted from “Contract particulars” can be amended to suit phased construction of various buildings. 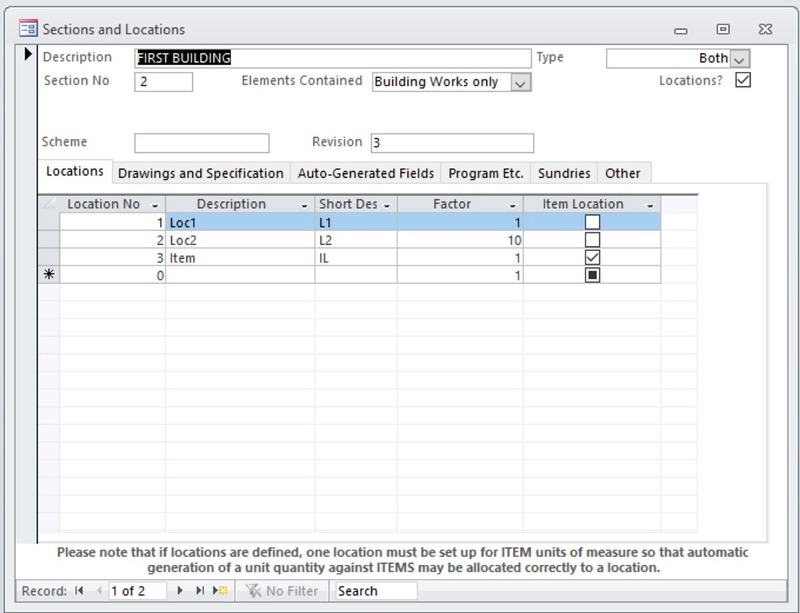 Upfront entry of measurements can be used later for the measurement of cost plan items. These are included on the output documents for information and calculation of efficiency ratios. Each cost plan item has a formula linked to each bill item whose variables can be set to reflect the current requirement (e.g. length, height, depth, etc.). 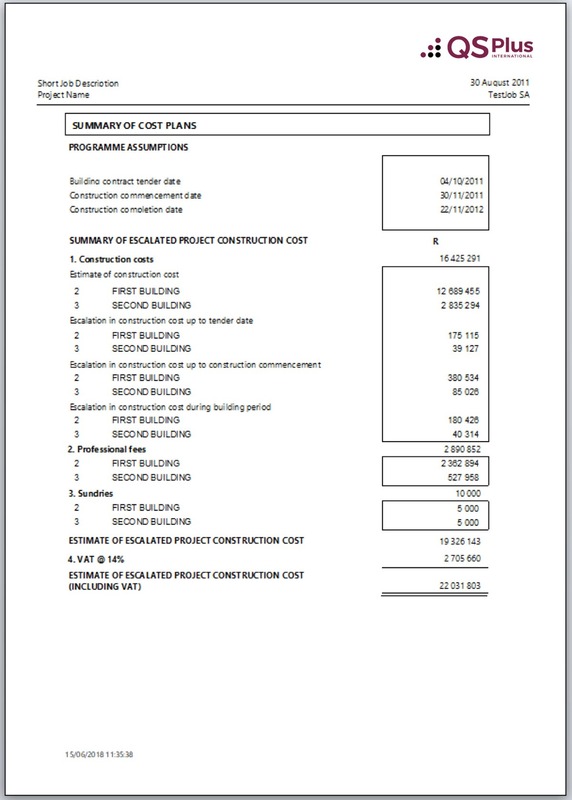 Edit cost plan item descriptions to suit your project (such changes do not affect the system library). Edit the variables in the formulae. Assign “Package’ to each rate build up item. Packages outside the principal contract will produce provisional sums when the bills of quantities are generated from the cost plan. Edit the rate for each line item from a central rate file. Enter the plug-in rate to override the built up rate. Output Executive summary / Elemental analysis and Item detail as an Excel document. Using the rate build up items associated with each cost plan item, this process extrapolates them into bill data using the quantity measured against each cost plan item. 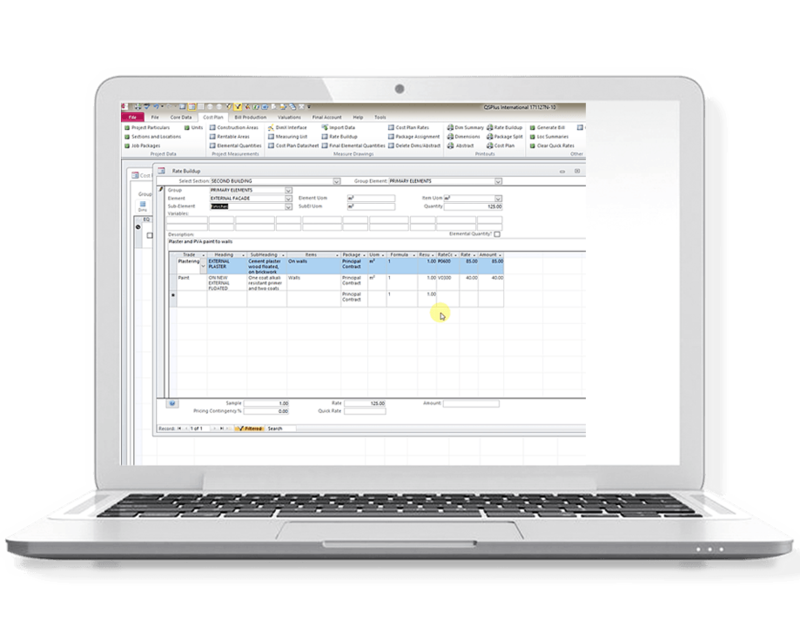 Trades, bill headings, subheadings and items are automatically generated. The principal contract tender document will automatically include items in the provisional sums trade, with the correct description and money value for all other packages measured in the cost plan. Bill items cross reference to the cost plan in full detail.